Offering the advantages of zero emissions and full workday operation on just one charge, the new all-electric Genie Z-60/37DC boom is ideal for indoor and outdoor applications, such as industrial plants, malls, convention centers and construction sites. Terex AWP's first entirely all-electric Genie Z-boom lift combines the benefits of quieter, environment-friendly operation with the four-wheel drive performance of a traditional diesel-powered machine. Offering the advantages of zero emissions and full workday operation on just one charge, the new all-electric Genie Z-60/37DC boom is ideal for indoor and outdoor applications, such as industrial plants, malls, convention centers and construction sites. As a result of its fast re-charging capabilities that provides full charge from a 110V wall power supply in under 14 hours, operators can use this machine every day. “The Genie Z-60/37DC model is our first all-electric 66 foot articulating boom. It shares a lot of similarities in terms of performance and components with our popular articulating Genie Z-62/40 boom model, and this is intentional,” said Adam Hailey, product manager, Terex AWP. Delivering 59 ft. 7 in. (18 m) of platform height, 36 ft. 7 in. (11.15 m) of horizontal outreach and 24 ft. 3 in. (7.4 m) of up-and-over clearance, the Genie Z-60/37DC boom lift offers the capabilities of a true articulating boom. Equipped with a jib that provides a high 70 degrees up and 65 degrees down range of motion, coupled with 160 degrees of platform rotation, operators benefit from refined positioning power at the boom tip. The platform on this new all-electric articulating Genie boom machine is available in 6 ft. (1.8 m) or 8 ft. (2.4 m) versions with a capacity of 500 lb. (227 kg) to provide two people access to the entire working envelope. Both platforms offer a side entry swing gate and front sliding mid rail as standard. The 8 ft. platform comes with an additional side sliding mid rail opposite the gate, for a total of three entry points. Another benefit of this new unit is its Genie FastMast system — a feature that enables the boom to be moved from full height to below grade and back with just one boom function. With the secondary fully elevated, the primary can reach all the way to the ground and then back to full height — the fastest way to 60 ft. (18 m). Drivable at full height, the Genie Z-60/37DC boom lift also is equipped with a dual parallel linkage design so operators can vertically track a building by simply raising or lowering the secondary boom. As a result of its rugged four-wheel drive design, operators will appreciate the “go anywhere” capabilities of this quiet, zero-emissions articulating Genie boom. With fully sealed AC drive motors that can still perform while submerged in up to 3 ft. (91 cm) of water, it also is able to go 25 percent faster and climb slopes better than typical diesel-powered units. Engineered with a proven drive and oscillating axle system, the Genie Z-60/37DC boom lift performs similarly to other Genie rough-terrain machines, such as the popular Genie Z-62/40 and S-60 boom lifts. It is equipped standard with all-terrain, non-marking tires that give operators the flexibility to work in interior and outdoor applications, making it one of the first machines on a job site — and one of the last to leave, according to the manufacturer. 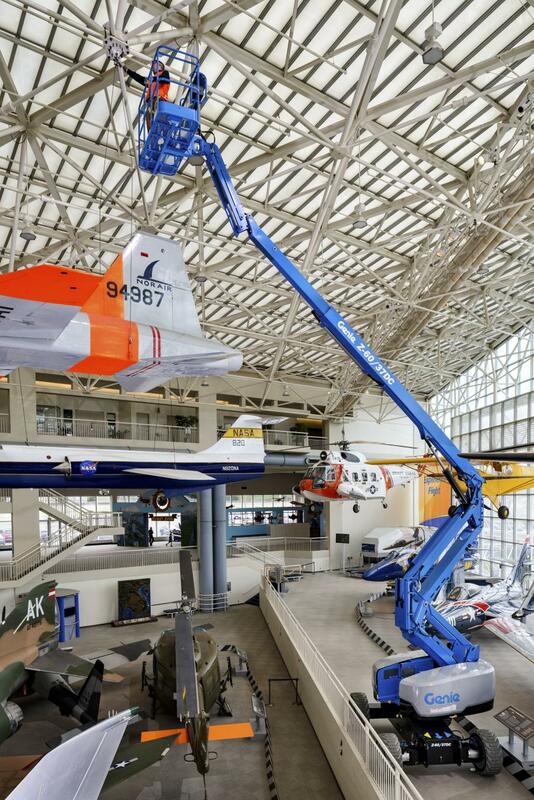 The Genie Z-60/37DC boom lift provides more performance in a compact unit than other 66 ft. (20 m) electric booms. Combining a narrow footprint with the advantage of a low tail swing of just 23 in. (58 cm) with the boom elevated, this new all-electric articulating Genie unit has what it takes to access confined areas on almost any job site. Combining a low machine weight of 16,600 lb. (7,530 kg) with the advantages of a 26 ft. 9 in. (8 m) stowed length, the Genie Z-60/37DC articulating boom is also as easy to transport on a standard truck, as it is simple and smooth to operate. The Genie Z-60/37DC articulating boom is available globally.